In today’s competitive market for talent, many employers are offering attractive compensation and benefits packages. In addition to salary, bonus, and equity compensation, “softer” benefits like expanded maternity leave, flexible schedules, and wellness programs are becoming more common. Are you planning a career change? Thinking of jumping to a competitor? Has a recruiter contacted you about a new job opportunity? If you answered yes to any of these questions, you will need to have a strategy in place to negotiate the best possible compensation package for yourself. Today, more women are advancing to senior positions within the life sciences industry. Along with added responsibilities, senior executives usually receive stock options or other forms of equity compensation as part of their compensation packages. In this lunch program, financial advisor Beata Dragovics provides an overview of the various forms of equity compensation, along with current compensation trends within the life sciences industry. Attendees will learn how to optimize their equity compensation packages, with a particular focus on managing concentrated wealth. Other topics include the tax ramifications of exercising stock options, along with tactics for treating equity compensation as a vital piece of your overall financial plan. Did you know that 57% of women have more earning power than before, that women are making major investment decisions, and 60% of women are the "breadwinners" of their families? Therefore, it is crucial to be informed and proactive about financial planning. 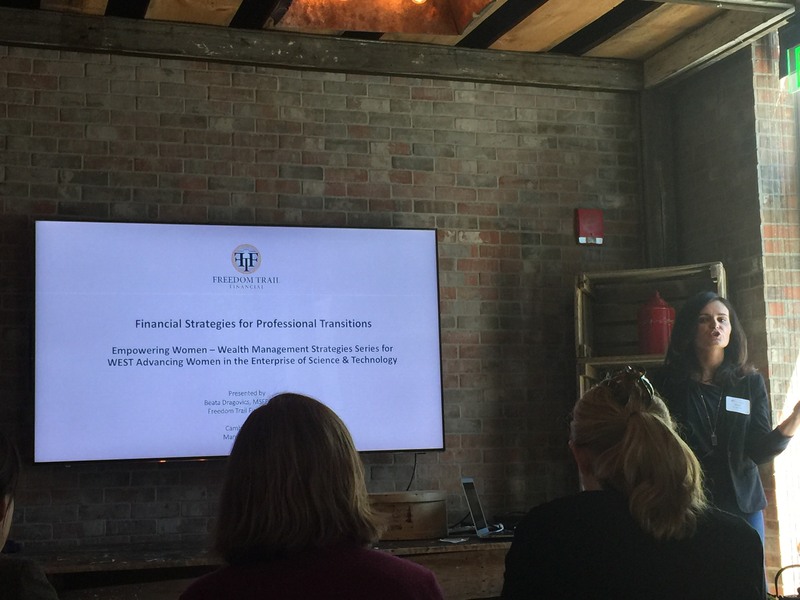 Beata Dragovics from Freedom Trail Financial takes a quite different and effective approach to financial planning, starting with the individual's values to set financial goals and plans. Beata graciously shared her take on 5 mistakes most people make when it comes to financial planning below. If you're interested in learning how to avoid these mis-steps, evaluate your own values and how they can map to your own financial goals and plans please join WEST for an interactive session with Beata on October 26th at 6pm. Participants will leave with a clear sense of how to plan for their values and how to set financial goals as it relates to compensation, equity, and savings.